It’s not that I haven’t been baking for the past year, I just haven’t gotten around to writing about it. Instead I wrote a dissertation (successfully defended last August) and subsequently a whole bunch of cover letters, research statements, and conference submissions (overall much less successful, so far). I baked themed cookies for my defense and for two of my colleagues. From left to right: my scaled centroid data cookies, a case study of a teacher’s problems of practice, Activity Theory in urban planning, and our celebratory graduation cookies for December’s commencement. Yesterday, though, inspired by a huge weight of stress over things I can’t control and social pressure to acknowledge February 14 as a Special Day, I figured it was time to try chocolate strawberry roses. 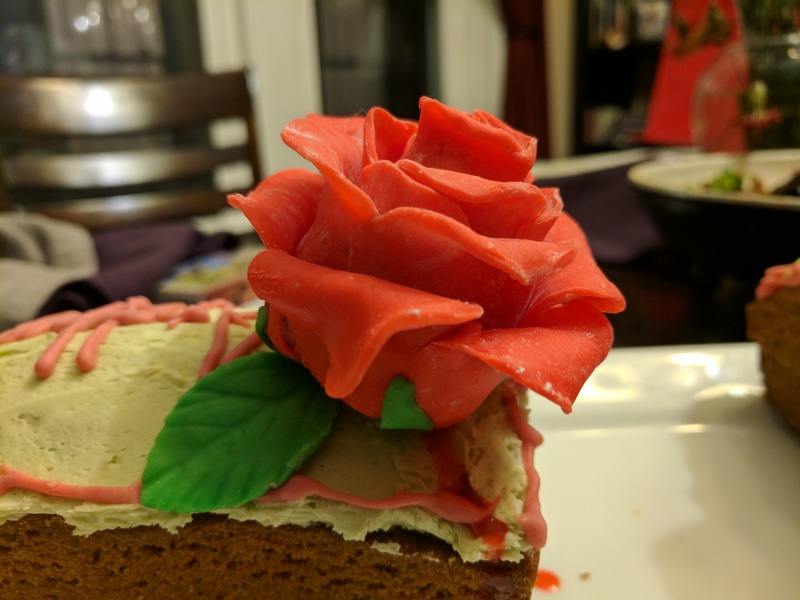 I came across the idea of using strawberries as a base for modeling chocolate roses so long ago that I don’t even remember the source. And I have the rose petal cutters from my Wilton flower set after the wedding cake, and strawberries were on sale at the grocery store last weekend, and I had a conference call yesterday afternoon in which I could participate without needing to type or write anything, freeing up my hands for forming petals. The stars were aligned. I’ve had my eye on a green tea cake with green tea lime buttercream frosting from a tea cookbook we got as a gift a while ago. 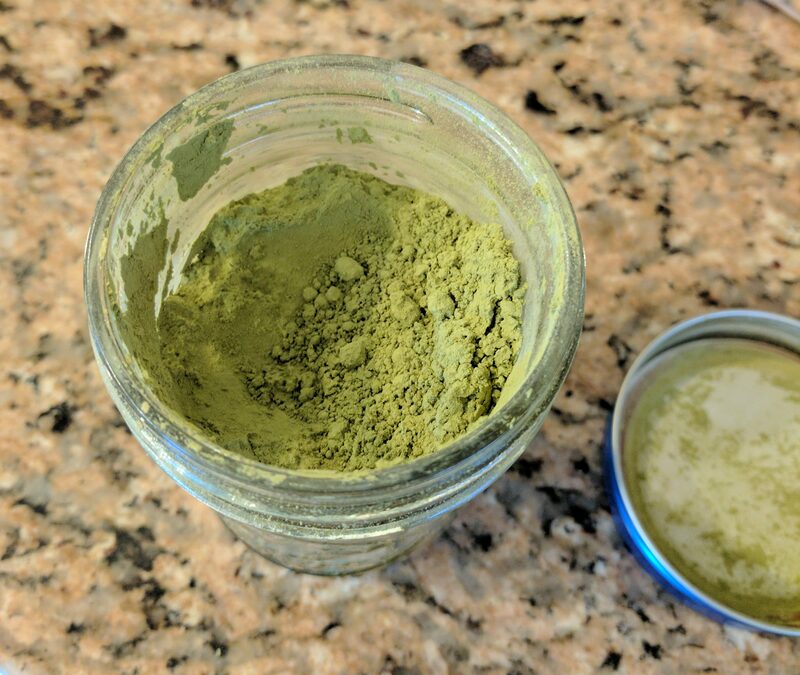 I had some trouble acquiring the required Matcha green tea powder in time to make it for my husband’s birthday last spring, but eventually I got the powder from a friend and just needed an occasion. Matcha green tea powder, in all its weird green glory. It’s a pretty basic cake recipe, with green tea powder as the only flavoring. 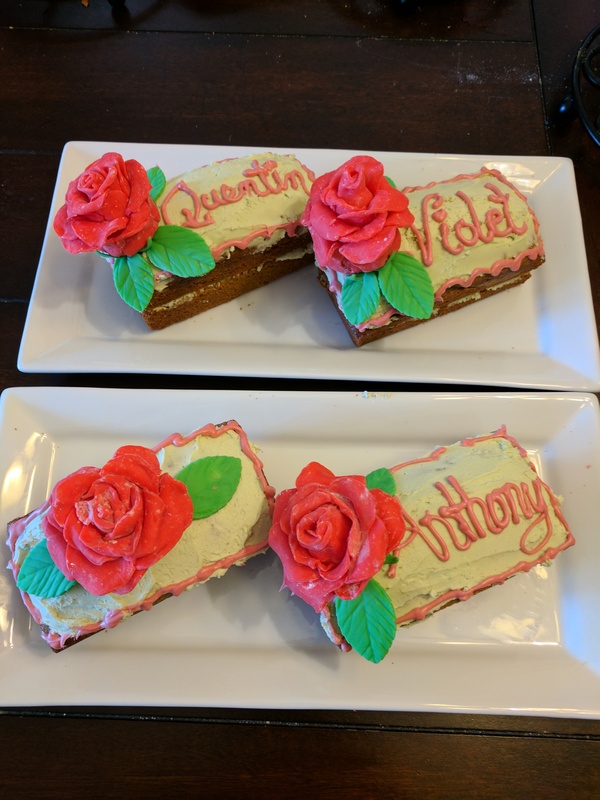 Since we’re a family of four, I decided to use our mini loaf pans to make four little cakes: one for each of my valentines, and a spare for me. There was enough batter left over for 7 cupcakes. I should note that the friend who gave me the Matcha powder was happy to part with it, as he’d imported it from Japan and didn’t end up liking it. After putting it into the batter, I decided I didn’t like it much either. It tastes like grass. But I was committed at that point, so I baked them anyway. These cutters and the ball tool were all I needed. I used my pasta machine to flatten the dough, but a rolling pin would have been fine. 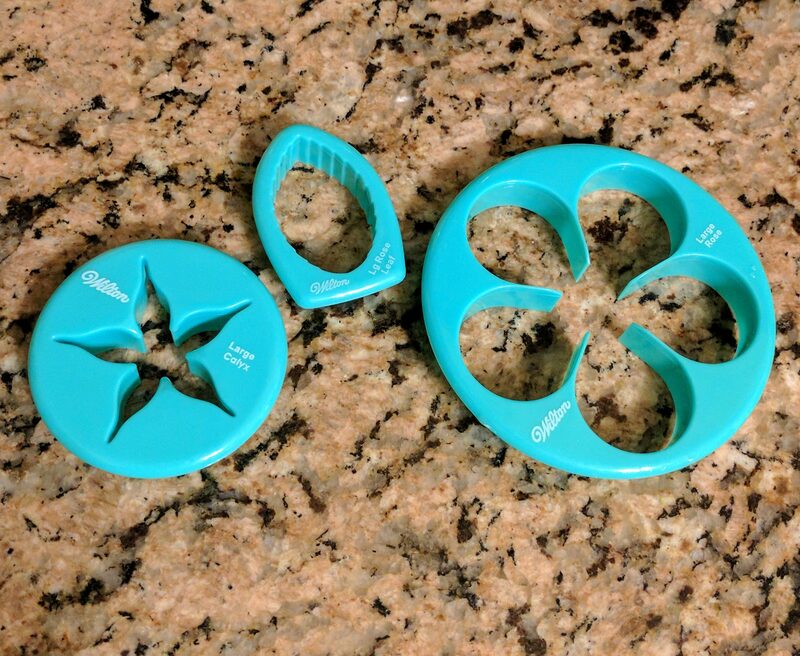 This is the Wilton “large rose” cutter, but it is too small for all but the smallest strawberries. 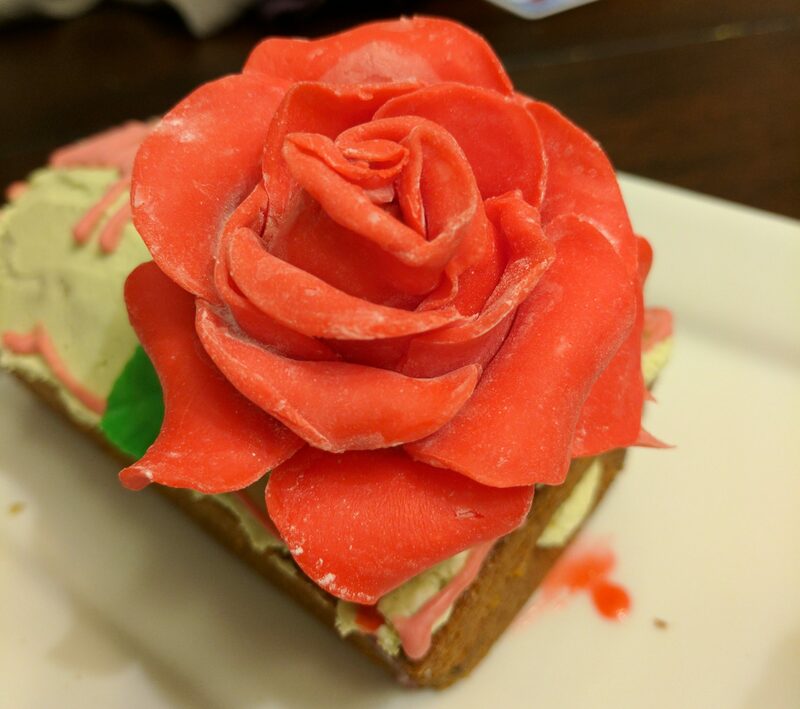 For each rose, I dipped a strawberry in melted (not tempered) white chocolate dyed pink to act as glue. I rolled the modeling chocolate to #3 on my pasta machine (#4 would have been better, ~1/16″) and cut out 3 large rose petal templates (5 petals each). I used the ball tool from my gum paste tool set to thin out the edges of each petal and folded together some of the scraps to make the centers. Then I added more of the melted chocolate to the petals, stretched them out to cover the strawberries, and set them into muffin cups to firm up, periodically adjusting the petals if gravity took too much of a toll. I had intended the flowers to be pink, which would have made the white powdered sugar I used to keep them from sticking much less obvious. Since the flowers ended up red, I dusted as much of the excess sugar off as I could using a small paintbrush. Still quite visible, but it was a forgiving crowd. The frosting in the recipe uses a cream cheese base. I decided to try a straight 1:1 swap of melted white chocolate instead of the cream cheese, blended it with the butter and powdered sugar, and reluctantly added the Matcha powder as called for. I skipped the grated lime zest because I prefer creamy frosting and used a little extra lime juice to make up for it (and to cover the tea aftertaste). It still tasted like grass. 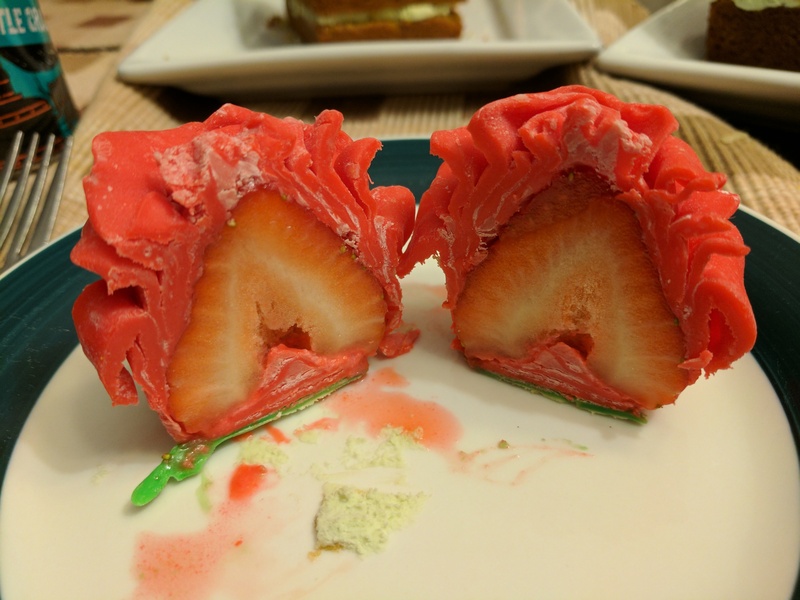 So I had this cake that I didn’t think was good (and I certainly didn’t think my kids would like), and a frosting with the same icky flavor (slightly masked by white chocolate and lime). Even though the roses had turned out well, I was not feeling optimistic. Before throwing it all away, I decided to try one of the cupcakes with the frosting. I don’t know how it worked, but somehow this combination is delicious. Meh cake + meh frosting = completely excellent. Some green leaves and the remainder of the pink melted chocolate to write their names on the cakes finished the desserts. Though my son announced upon seeing the cakes that he was going to eat his conversation hearts from school for dessert instead, he eventually came around, and they were a hit with everyone.